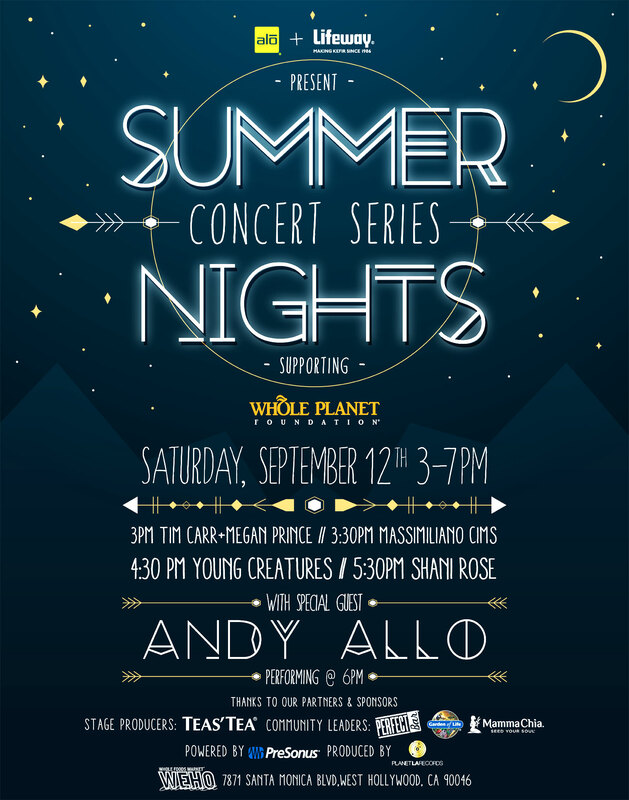 #‎WFMSummerMusic‬ series supporting Whole Planet Foundation finale on Sat Sept 12, 3-7pm at Whole Foods Market – West Hollywood. Presented by ALO drink & Lifeway Kefir featuring Andy Allo, Young Creatures, Shani Rose, Tim Car & Megan Prince, Massimiliano Cims! Sound powered by PreSonus Audio Electronics. Thanks to Stage Sponsor @Teas’ Teas’ Tea and Community LeadersGarden Of Life, Perfect Bar & Mamma Chia and supporters Chameleon Cold-Brew, Hubert’s, Ka-Viti Water From the Fiji Islands and more. Free show, all ages, and free samples from our partners in support of a fantastic cause!